At Nyhof Custom Gutter & Aluminum, our mission is to deliver nothing but the best customer care possible through professional installation services, quality products and outstanding after-sales support at affordable prices. Our team brings more than 40 years of industry experience to the table and has served thousands of satisfied customers around Sheboygan, Ozaukee and the surrounding counties. When you hire us, not only will you receive the benefit of quality materials and expert workmanship, but also the assurance that your job will be completed on budget and within your specified timeframe. We attribute our success in business to our firm commitment to our primary mission and to our partnerships with some of the most trusted brands in the American home improvement industry. Our team’s specialty is the installation of Gutter Helmet® systems, which are uniquely engineered to keep leaves, twigs and other debris out of your gutters without getting in the way of the flow of water. We’re proud to be an authorized dealer for the nationally-recognized brand that has been the number one choice in American gutter protection for well over 30 years. Our catalog of product and service offerings also includes heavy-gauge aluminum seamless gutters, replacement windows and doors, cellulose spray-on and SPF insulation, siding, soffits and fascia. Get in touch with our office today by calling (800) 824-3772 to get a free, no-obligation estimate. You can also schedule a free on-site gutter system analysis by filling out our online form. 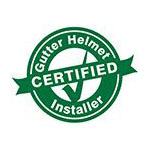 Our Gutter Helmet® sales representatives will be happy to assist you in your inquiries.